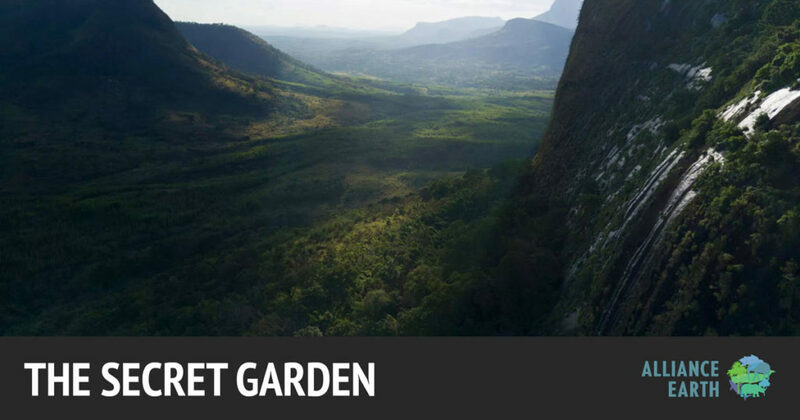 How Google Earth led a team of scientists to discover an untouched mountaintop rainforest. 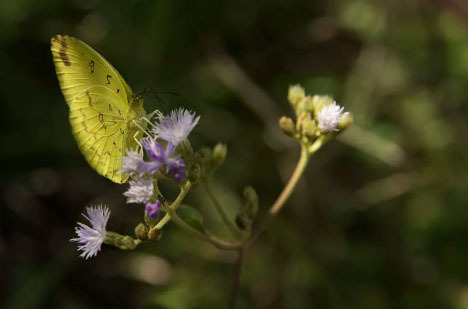 The story of the Mount Lico expedition began six years ago when Bayliss, a conservation scientist and butterfly expert, happened to spy a small forest atop a mountain using Google Earth. It wasn’t the first time he’d found such a place; Bayliss had been using Google Earth to explore high-altitude rainforests in Africa for around 15 years. 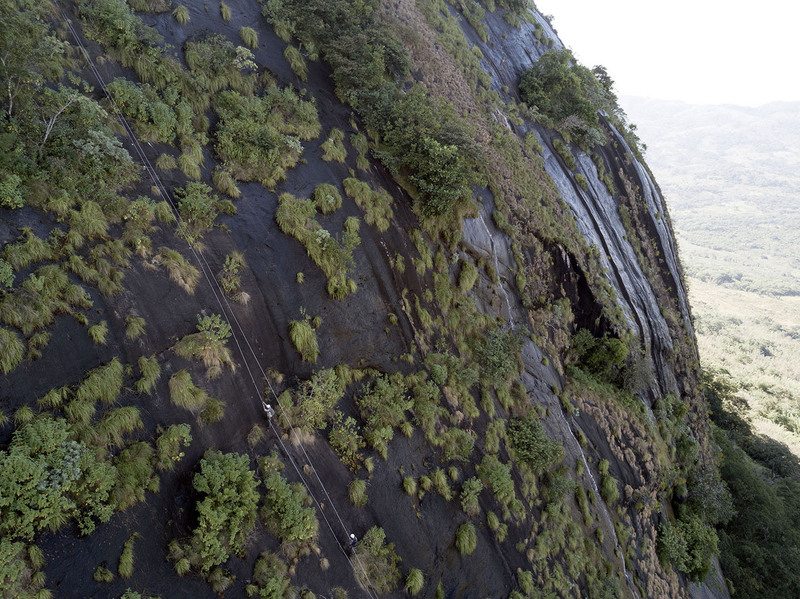 In February 2017, the time was finally right: Bayliss brought a drone to the base of the 410-foot sheer rock protuberance (technically known as an inselberg) to confirm that there was a forest on top. This was no small feat. The area surrounding Mount Lico is a patchwork of smallholder farms, tea and eucalyptus plantations, and woodlands. There are no paved roads, no hotels — just rivers to cross, plants to hack away with machetes, and miles of dirt track to navigate. While locals were aware of Mount Lico and used the natural resources of surrounding forests, its tall, sheer walls meant that it was nearly impossible to access, which made it likely that the land on top was untouched by humans. However, scientists would later find out that someone had been up there at least once. For Bayliss and his team, Lico presented a unique opportunity to document our planet and its changing climate. Its forest is, as one member of the team later wrote, a “time capsule.” Documenting Lico paves the way for preservation. 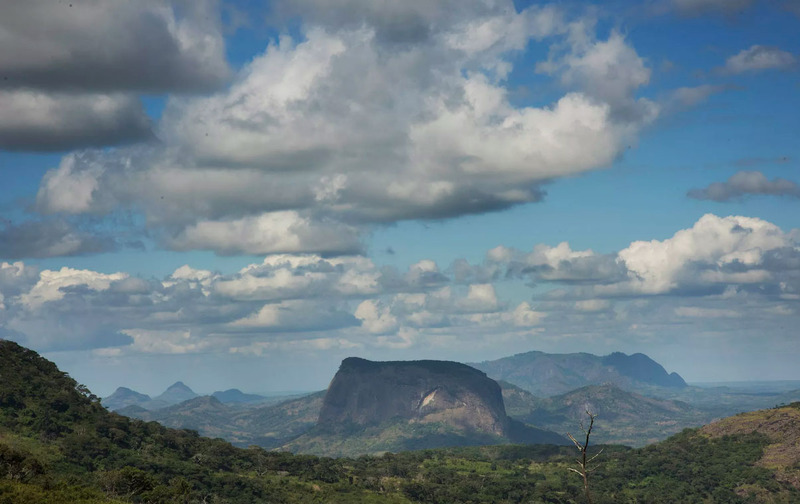 It “fits in to a much longer and wider conservation program for these mountains in northern Mozambique,” notes Bayliss. 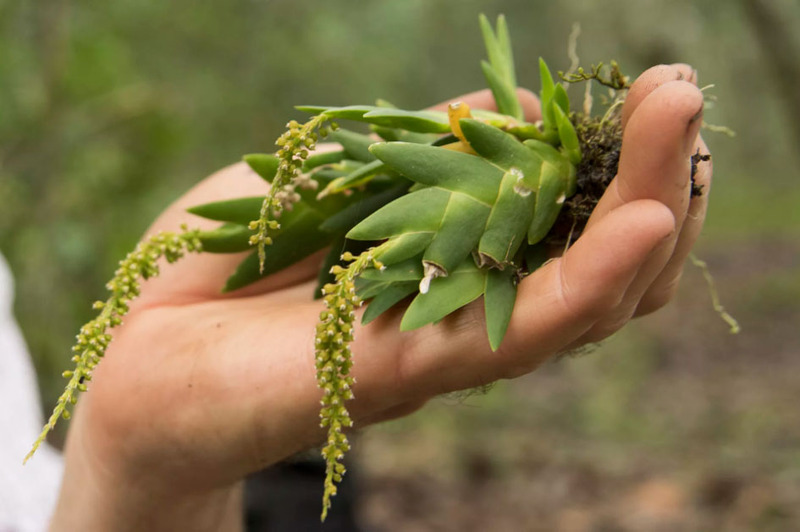 And discovering new species and raising the profile of the region will help protect the surrounding ecosystems and create a more complete understanding of biodiversity in Mozambique, explains Hermenegildo Matimele, the expedition’s Mozambican leader. 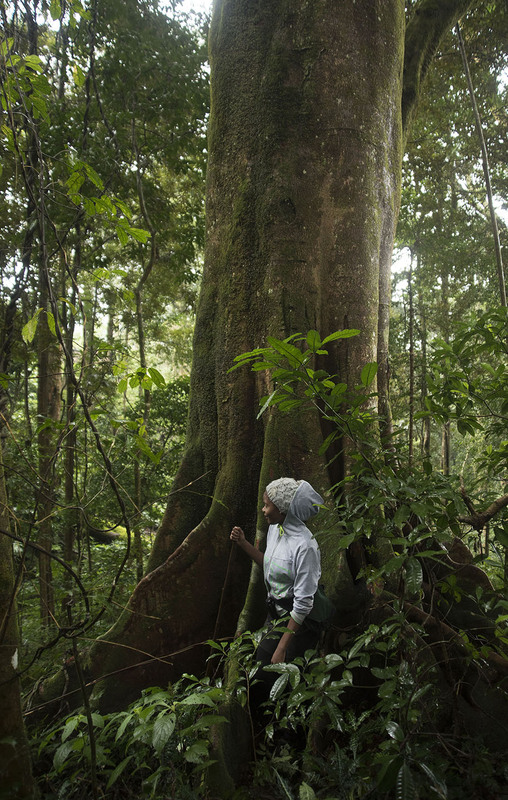 Matimele adds that, in turn, conservation efforts would benefit local communities that rely on the region’s forests for food and are negatively impacted by deforestation in the long term. “It’s going to guide our strategies in terms of how we use the land,” he says. 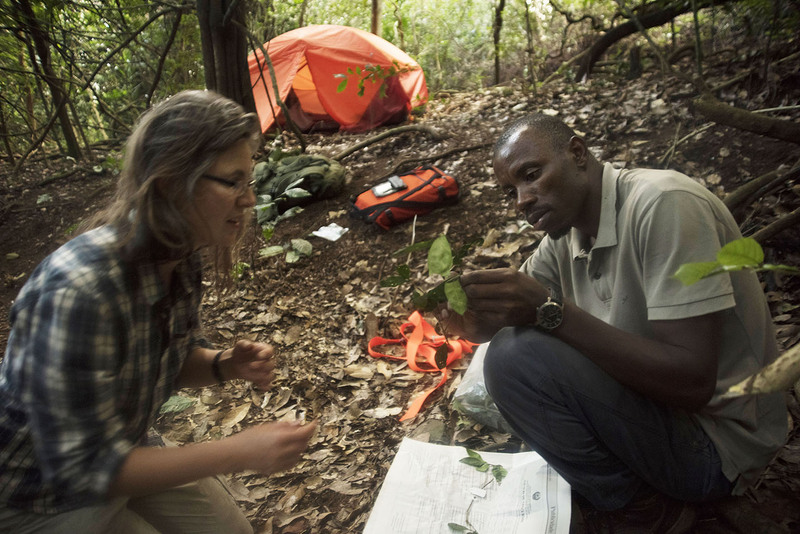 For two weeks this past May, Bayliss, Matimele, and a “dream team” of scientists finally convened in the mountains of Mozambique. They set up three camps: a base camp, a satellite camp atop Lico, and another camp at nearby Mount Socone, where, in recent years, farmers have been clearing the rainforest at an alarming rate. 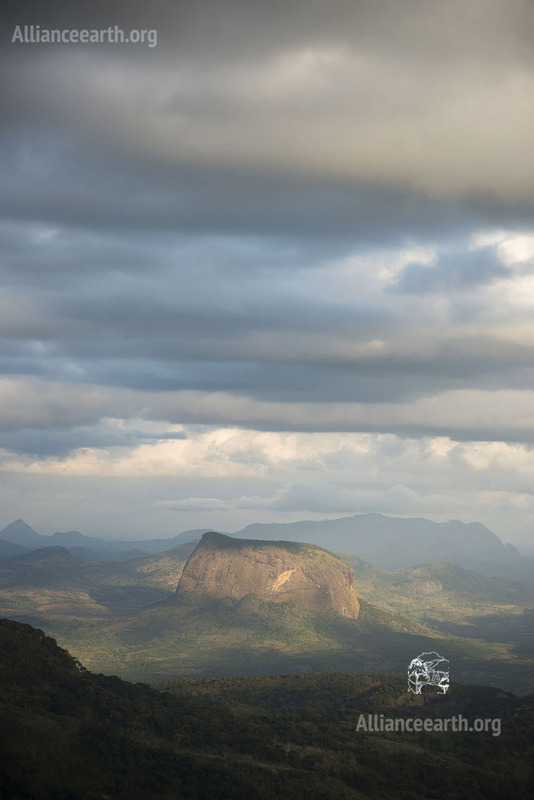 The expedition included two of the world’s top climbers, who taught the scientists, on the fly, how to scale the rock face of a mountain; a chef; three Mozambican scientists, who documented the wildlife and plants; a trip logistics planner; a medical doctor; experts in everything from carbon dating to small mammals; and an 84-year-old butterfly specialist with a fondness for whiskey. 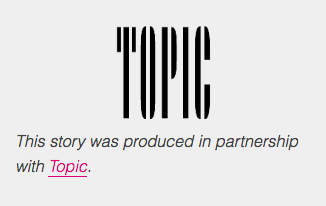 We interviewed 23 members of the group to hear their tale. It was, for everyone involved, a once-in-a-lifetime experience. The initial reaction of the prospective explorers when they heard the news about an untouched forest? Wonder. Julian Bayliss (biodiversity and protected areas specialist, professor at Oxford Brookes University): I started systematically going across Northern Mozambique, scanning it using Google Earth satellite imagery. I came across this mountain range where Mount Socone is. It’s in between Mabu and Namuli [two nearby mountains], which I knew about before. Just below that, I could see this sort of crater-like mountain with this dark, round patch. I thought, “Oh, that’s got to be a forest.” I then zoomed in to that and was looking at detail. I could see that the surrounding land was all heavily cultivated and quite badly disturbed, and there were roads and everything else. But the base in the forest was completely intact, dark green, no evidence of disturbance. I zoomed in more closely to the crater, the actual sides of the mountain, and I could see that they were this smooth granite. It was an inselberg. The sides were steep, smooth, fortress-like. And that’s when the excitement came because if you can’t get up there, then that forest is unique, extremely special, highly undisturbed, very rare. You’re looking at a site where no humans have been before, or at least very few humans have been before. Jonathan Timberlake (independent botanist): I looked at it on Google Earth and … realized that it was really quite a very, very unusual situation. The vegetation on the top was very thick. It was sort of a forest. You can never be absolutely sure whether something’s forest or just dense woodland, but it looked very interesting. Joanna Osborne, a botanist with the Royal Botanic Gardens KEW, left works with Hermenegildo Matimele, right, curator of the Maputo Herbarium in Mozambique on top of Mount Lico. 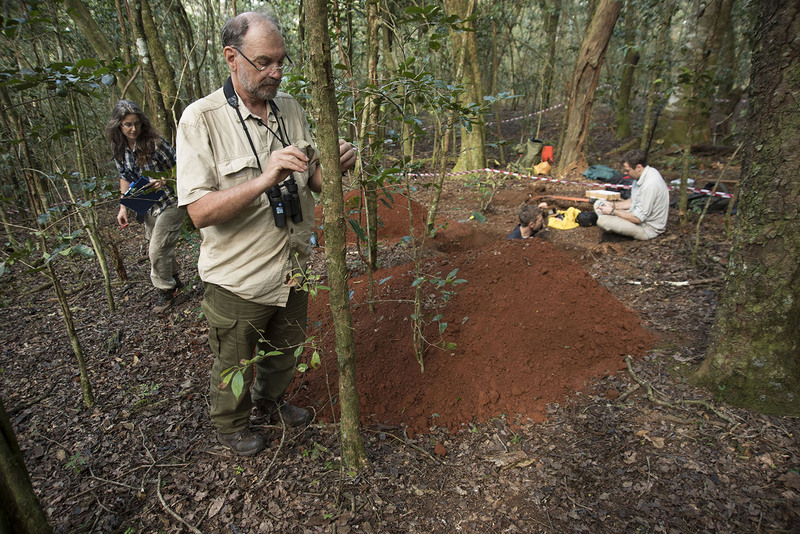 Botanist Jonathon Timberlake, center, works with Joanna Osborne, left, to measure tree thickness and type in the plot set out by Professor Simon Willcock, sitting, while Professor Phil Platts from the University of York who stands in the test pit on top of Mount Lico. As a veteran expeditioner, Bayliss knew such an undertaking would require far more than Jeeps, tents, and willpower. The plan was to visit a uniquely undisturbed forest, and reaching it would involve a vertical climb of over 400 feet, the equivalent of two Leaning Towers of Pisa. Simon Willcock (lecturer in environmental geography, Bangor University): [Julian] sent me an email and asked if I could come. I was so excited. But you can’t get too excited in academia because you apply for money, and you only get it about 1 in 10 times. Bayliss: I knew I needed a climber, [and] I thought, “Well, who’s the best climber I know?” It was quite obvious that Jules Lines is the best climber I know. I called up Lines, and then we started to look at the drone footage of the rock so he could assess the climbing elements. Vanessa Muianga (marine biology intern, Natural History Museum of Maputo): I am an intern of the Natural History Museum on Mozambique. It’s important when you do the expedition in Mozambique, you have to take [local scientists]. On the expedition, we have [four] Mozambicans. Jeff Barbee (journalist and director of Alliance Earth): Very rarely do you get a chance to go on an expedition that’s been individually curated to get the best people. Not just the people who are the best in their fields, but people who are collaborative and kind to one another, [who] help drive that sort of communal discovery excitement forward. Bayliss: The team that I selected for this expedition was really the culmination of the last 30 years of my experience of running expeditions. The team I selected are the best in the world. They are the leaders in their scientific fields of expertise. They are the leaders and the best in terms of rock climbing. They are the leaders and the best in terms of running and putting together and organizing, supervising and doing all the logistics for expeditions of this size and this nature. Biologist Ana Gledis da Conceição Miranda walks through the forest near Mount Socone. Getting ready to send 28 people from around the world to three sites (the top of Mount Lico, base camp, and Mount Socone) took an incredible amount of planning. Bringing in the experts — Mozambican scientists and organizers — was crucial in getting the project off the ground. Roland Van de Ven (expedition doctor, technical director at Elizabeth Glaser Pediatric AIDS Foundation, Tanzania): I had sleepless nights before I went. I check, double check, triple check — really checking if I have enough of everything. Then you start thinking about scenarios… because you never know what’s going to happen. You don’t know really who the people are, and you don’t know their medical background. Maybe there are some people that have diseases that you are not aware of, maybe someone is diabetic. These things go into your mind. Ara Monadjem (mammalogist, University of Swaziland): I had exactly two changes of clothes in my bag [for] a 10- or 12-day expedition. The rest was all my scientific equipment. I had a net to catch bats. I had bags to hold them in. I had various pieces of equipment to measure and weigh [animals] and so on. Cooper: [Julian] didn’t get enough funding for me to go. He just decided to pay for my ticket out of his back pocket. I really didn’t have much time to organize before I went out. Bayliss: [There are] a lot of similarities between what we do now and what, for example, the great explorers used to do 100 years ago, 150 years ago. We still use various modes of transports like airplanes, motorized vehicles, bicycles, and we walk on foot. And, generally, we take this sort of mode of transport to what you could say is the end of the road, which normally is a village or something like that. And then that’s when mechanized forms of transport basically stop and you talk to the local chief. You organize porters and you organize guides, and then you go from the village, with the blessing of the local chief, to the forest or wherever you’re going to be exploring. Monadjem: I live in Swaziland, so I [flew] to Johannesburg, and then from Johannesburg to Nampula. [Then] Julian put us into four-by-four vehicles, and we did a very long drive. I can’t remember how many hours it was, but it felt like it was never going to end. Eventually, we arrived at the field site at the end of a terrible dirt road, maybe at nine o’clock at night. I had been up since four that morning, only to be told that we have to walk another half an hour to get to our field site with all our bags. Muianga: It was many people, all spoke a different language [from me]. It was complicated to communicate and understand. It was so difficult because they talk very fast, and we don’t understand anything in the first two days. But the next days, it was a little bit [better]. They are very kind people, make us feeling comfortable. And we make them feel comfortable because they have local people and they talk in our language and we have to translate. Brewin: I had to negotiate a lot of access, hiring porters and workers, that sort of thing. There is a lot of dealing with staff, a lot of driving people around from one site to the other or the airport. There’s a lot of putting up tents, work constructing furniture out of twigs and sticks, lighting fires, and just general camp stuff. Barbee: The local people are the stewards of these environments, and so often we find in these places that the local people have been subsisting around these forests for a really long time. They have a very strong, vested interest in keeping them safe because they get firewood for one, but they also get medicine, and food, and sometimes even shelter. They use them as places to hide during times of conflict. Now, that being said, in a lot of these places, it is the local people who are now finally chopping them down [for valuable lumber]. They’re often doing it with the help of foreign nationals from other countries, whether they’re from Portugal or China or other countries. These people are paying folks to go in and chop these hardwood forests down for money. Joanna Osborne (botanist, Royal Botanic Gardens of Kew): We took a local guide with us, a very nice guy. He had a disability to one of his arms but still managed with the other to use a machete and help us to carry stuff. He took us around into this woodland, and we were asking about how much people used some of the species. And we found out some interesting information, like one of the tree’s bark was used for making rice containers for harvesting. So, you see, this woodland was being used by local people. Brewin: There was a suspicion originally that we were there prospecting metals and minerals, that kind of thing. People started coming in with stones and stuff, saying, “Look at this.” We would say, “No, no. We’re not interested in that.” Then, eventually, they twigged that we were interested in biodiversity, flora, and fauna, and people started coming in with chameleons. A guy came in with a puff adder on a stick, that kind of thing. Simon Willcock and researcher Gabriela Bittencourt move up the fixed lines on Mount Lico. Most scientific research doesn’t require scaling 410 feet of sheer rock face. Barbee: People ask, “Well, why wouldn’t you guys just take a helicopter?” Obviously they haven’t seen the type of funding that science attracts these days. Helicopters are right out of the mix for most scientists around the world… The only way that we could get up there affordably and in the time allotted was that we would have to climb. 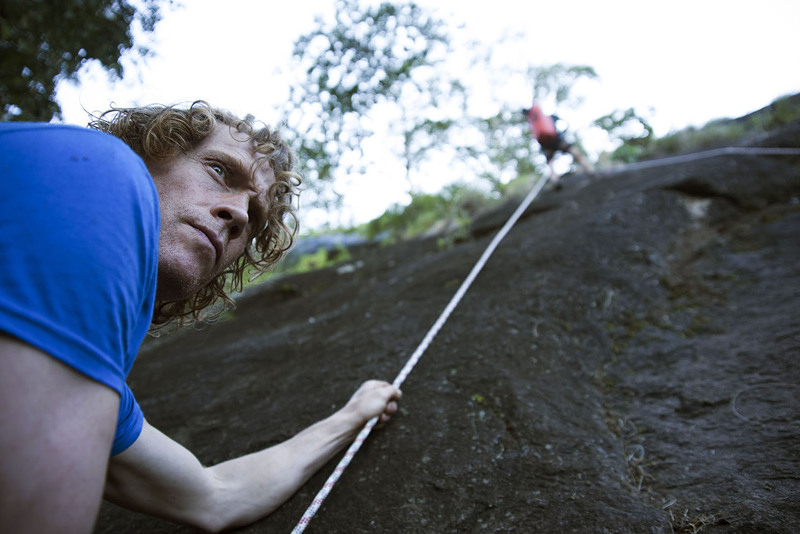 Jules Lines (expert climber): I’ve worked in Singapore, [and in] Brazil. I’ve worked all over the world being a safety supervisor for rope access work where we need to inspect oil rigs, or [go] underneath oil rigs. That’s generally been my work for the last 25 years. Everything in my life is climbing-related. Monadjem: When we walked out to the base of the cliff, that [was] the first time it struck me that this was going to be a serious climb. When we looked up, we couldn’t even see the top of the cliff. That’s how high it was. When I first got harnessed in, I started feeling quite apprehensive and wondering if I was going to make it to the top. It didn’t look physically possible. It was very tough for me because for maybe up to halfway, I wasn’t using the right technique. I was basically just pulling myself up with my arms. Then, at the halfway point, I realized that I didn’t have the strength to go to the top. I had to learn how to use the equipment properly. My hands were destroyed. For the entire trip, I had problems with my hands. I had two or three big blisters that burst on both hands. 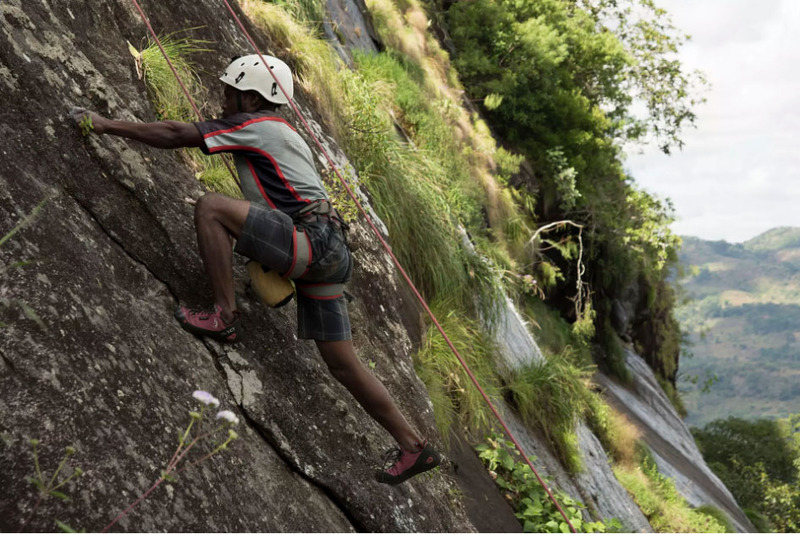 Matimele: I never used a rope to climb before. So it was so exciting. I only saw people using ropes to climb mountains in Cape Town, and I never had done that. So it was a little bit of pressure, when I was sort of halfway, when you look back and see how far you are. And you think like, “What happens if this rope—?’’ But, you know, it was okay. I didn’t die. Barbee: Every single person who attempted to go up made it. And that was a testament to the fact that [climbers] Mike Robertson and Julian Lines were so patient. I’d watch them explain it and explain it again for hours. And if somebody really struggled getting up, then one of them would go up the second line. We had two lines coming down from the top. And then [the climbers] would literally coach them all the way up to the top in the most patient, kindest, most gentle way. I was gobsmacked. Timberlake: I just steeled myself that this was what I was going to do and just was determined to do it. and I think quite a few others are in a similar boat. You’ve decided you’re going to do it and you just do it. You don’t think about it too much, and you just go and go and go. But it was very exhausting. Brewin: Julian Lines, the free climber, once the ropes were up, he could get up in 11 minutes, and he wouldn’t use anything, you know, any of these fancy bits. He just went holding onto the ropes and [ran] up. He was absolutely incredible. And there’s me doing about 35 or 40 [minutes], and other people who are taking an hour and a half or two hours. The two climbers were pretty much as close to superhuman as I’ve seen. It was a humbling experience for those who ascended the inselberg. Barbee: When I got up to the top, [the] first thing was I was incredibly out of breath. I was covered in sweat so badly that there was sweat dripping out the top of my boots. It’s winter in Southern Africa, but that doesn’t mean it’s cool. I was surrounded by butterflies, so many different kinds — some close, some small, some big, some… just so many butterflies. I just stood there surrounded by them, panting and realizing that I was getting into something very special. It had that feeling to it. That’s not a very scientific term, but I can say that I’ve been to many places, and the moment I entered that forest, I thought, “Wow. This is something very, very special.” And it felt very old. Lines: It’s all a bit eerie, and you’re looking around, and the first thing I noticed was it was just teeming with butterflies in the trees. Bayliss: There were many emotions flooding [in]. It was an amazing sense of arrival. It was an amazing sense of adventure. It was an amazing sense of excitement. It was an amazing sense of wonder. And then walking through the forest, listening, looking, smelling, hearing, looking in wonder at the undergrowth, looking in wonder at the trees, seeing lots of small mammal tracks going across the ground, some of them very well-worn, which is very exciting because that means we’ve got stuff up there, small mammals up there running around all over the place. Willcock: You had to wait for the adrenaline to die down before you could take in the mountaintop. Ana Gledis da Conceição (lab technician and mammalogist, Gorongosa National Park): It was paradise. It was like — wow — things that I saw on television. It was very, very, very different. It was very beautiful. Matimele: It’s like you’re flying. You can see down, you can see the vegetation patterns, you can see how the communities are arranged between the natural vegetation and the transformation of the habitat as a result of human activity. Brewin: You’re on this kind of monolith, this big, granite boulder. You’re looking out across the local area for miles and miles, and you see the extent of human interaction with the environment, the amount of deforestation that has gone on, the amount of planting of these eucalyptus plantations. And you know that 50, 60, 70 years ago, it would have just been pristine miombo woodland [a type of African forest]. There’s sadness as well that you feel because you know it’s changed. It’s gone forever, and it will change more. And you know that you’re standing on the last little remaining fragments of what was a kind of African paradise in a way. So yeah, [it was a] privilege but shrouded in a bit of regret and a bit of sadness for what was gone. Over two weeks, the team slept, ate, worked, and socialized in close quarters. On many expeditions, personality conflicts are common, but the Mount Lico team got along unusually well. Bayliss: We had three camps on the go all the time. We had the satellite camp on Mount Lico, we had the satellite camp on Mount Socone, and then we had the base camp in between. The base camp was your hub where people were coming and going. And then teams would come in from Socone and go up Lico. The whole of the expedition, people were coming and going, moving in and moving out and moving through. Osborne: The mountain camps were much smaller and everyone was much busier because we had this really small window of time to do all your work. In the base camp, there were loads of jokes. It was really fun. Matimele: You all sit around the fire, and you have dinner, you tell stories, and you get to learn about each other’s personality. Ben Hayes (camp logistician): Each day [was] very different. You might be picking people up from the airport, which is [a] seven-hour drive. You might be just resupplying a bit on food. You might be dealing with local politics, different demands from village chiefs, or making sure all the local permits and that kind of thing are in place. Monadjem: Some days, there would be bread but nothing to put in it. On other days, there would be slices of cheese but nothing to put the cheese on. Eventually, it all sorted out and we even had one relatively nice meal at the top that Julian made. I don’t know how he managed. He boiled up some pasta and had some nice cheese that he grated on top of it. It turned out to be quite a delicious meal — or we were just so starving that it tasted good. Colin Congdon (butterfly expert): The only thing that I deeply regret is [a local] brought a pig along, and we neglected to pass the hat around to raise enough money to buy it. That would have given the whole camp fresh meat, which we didn’t have. Cooper: People would eat [dinner] about 7 o’clock or [6:30]. Then, we’d all hang around the fire and have a whiskey and all head to our beds before probably before 10 o’clock. A lot of people were in bed before 10. I did stay up a bit later, to be honest with you, because I had my fire and I slept right next to the kitchen area. Somebody would chat up and have a whiskey with me. I think that’s just what the chef does, isn’t it? Congdon: It was really great to have intelligent conversation evening after evening when everybody came in from the field. During the day, the camp was pretty much empty. But it was very convivial in the evening. I myself actually took in three bottles of whiskey, and I think they lasted four days. Barbee: There would be Colin Congdon, 84 years old, one of the greatest butterfly experts ever in Africa, sitting there excitedly giggling over butterflies, chatting to Vanessa Muianga from Mozambique, who’s 27 years old and works with the Maputo Museum. It was a sort of round circle, looking at different samples of things, sharing and talking, leaning over each other’s shoulders. Camp culture was very much a communal experience of discovery. It was like teenage boys showing each other their baseball cards. 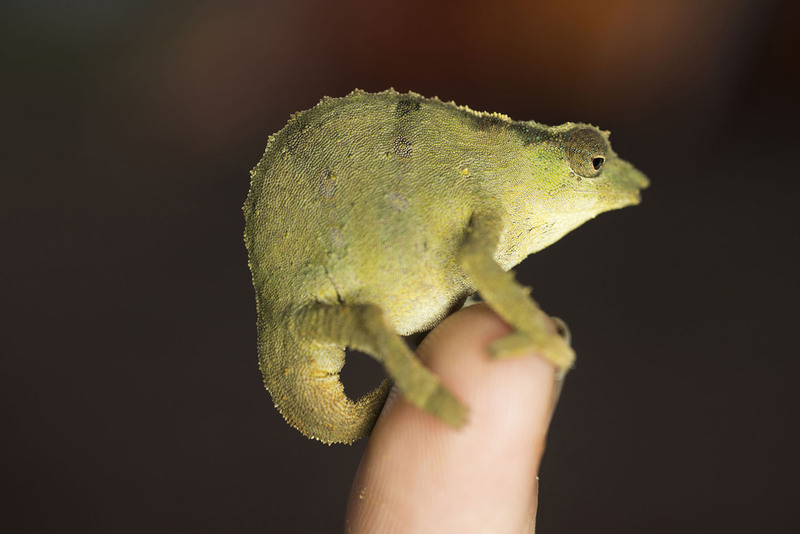 A Rhampholeon, or Dwarf Chameleon, found during the expedition in another forest on nearby Mount Socone. 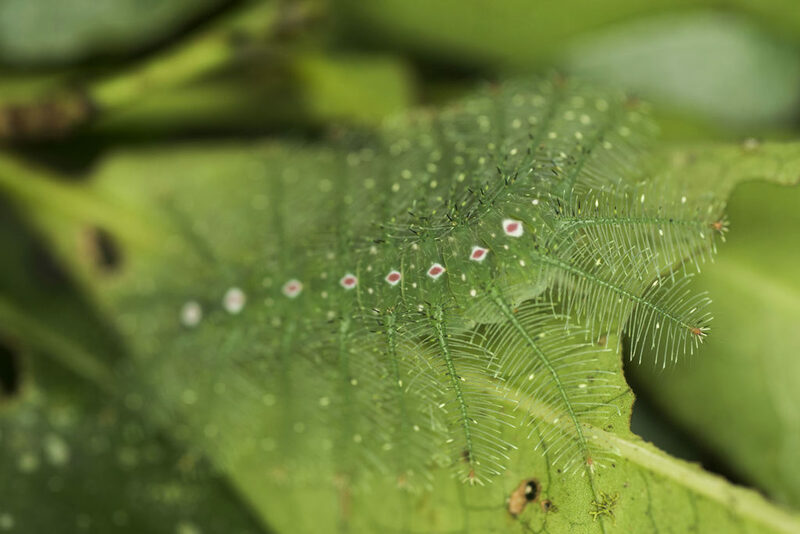 After arrival, the scientists began their investigation of the fauna of Mount Lico and Mount Socone, which included a menagerie of small mammals, reptiles, amphibians, crabs, fish, (a few) birds, at least two antelope, and an army of butterflies. The team has already confirmed a new butterfly. And while data and DNA samples are still being processed, it is likely that they have encountered other previously undocumented species. Barbee: Very quickly, we realized that there were very few birds up there at all. So, it had a completely different sort of sound than most forests, where you wake up at four or five in the morning [to something] we call the dawn chorus: it literally sounds like something out of a Hollywood movie of the jungle with the sounds of all these crazy birds and things sounding off just before dawn. It did not have that. It was much more quiet. A still place. It felt like you kind of walked into a museum. Monadjem: I’m an avid bird watcher, so I’m always looking out for birds. I never saw a single bird in that entire five days. Not a single bird. That is, to me, quite amazing. There were one or two birds that were singing, and occasionally I’d hear a bird calling, but I never saw a bird. The lack of birds [was] maybe [because] the nestlings were being eaten by the ants. I don’t know. It is just a guess. Cooper: Frogs lived under the tents, and when we took them all down, we found loads of frogs. Monadjem: There was the giant rat, there were spiny mice, there were soft-furred mice that I caught quite commonly in the traps. There were several species of shrews that we caught in bucket traps, pitfall traps. I didn’t have much luck with catching bats. da Conceição: On top of the mountain, I found some interesting poops. I didn’t know what kind of poop it was. And can you believe that — beautiful poop. And I went, “Huh. I need to know what this poop is.” It was a beautiful poop of seeds and a little bit [of] beans. I collected a sample and showed it to Ara [Monadjem] at base camp, who told me it was a small species of rat. Monadjem: The giant rat, by the way, is a pretty interesting animal. It is the size of a cat with a very long tail. It looks just like a typical rat that [you] would see in any part of the world, but it is the size of a cat. It has a beautiful long tail. Bayliss: Going through the camera traps and then actually seeing that one of them had actually caught a picture of the antelopes was a wild moment. I was like, “Oh, wow. Great. We got it. We needed this. We needed this picture. What is this antelope doing up here? How did he get up here? How long has it been up here?” This is a mammal. This has been isolated for a long time. I’ve collected fresh dung, and that’s been sent to a lab for DNA analysis to determine if it’s a new species or not. Osborne: Somebody found a catfish in the stream, and they managed to catch it as well, which seemed really bizarre, that a catfish had gone up there. Bayliss: I got a new species of butterfly from Lico, which is lovely. And this butterfly will be named after the mountain. A curious reality of life on Lico was that there were very few birds, but lots and lots of spiders — which meant lots of webs. Willcock: Lico was covered in caterpillars and absolutely covered in spiders as well… Almost every tree was connected to another tree by a spider’s web. As you were walking forward, the first person got loads of spider webs in their face. Monadjem: The only way to walk was to carry a stick vertically in front of you that would capture the spider webs as you walked. Every single step you took, you would take a spider web with you. I think this was probably an indication of the fact that there are no birds around. If there were birds there, they would have been eating those spiders. Willcock: People would [develop] Matrix-like avoidance strategies. You know, where you’re sort of leaning backward because you’ve seen it just an inch before you hit it with your face. Once on top, the researchers found that Lico had some unusual features. Willcock: We looked at above-ground carbon and below-ground carbon. For above-ground, we measure a plot that is 20 by 20 meters, and in that, every tree over 10 centimeters in diameter; there are seedlings and other small trees that aren’t measured. There are equations then that help you calculate how much carbon is in each of those trees. That gives you the above-ground carbon. The really labor-intensive stuff was the soil pits we dug. Initially, we thought the soil would be quite shallow. If we got to a meter [a little over 3 feet], we thought we’d be lucky because it’s on top of a mountain, [and] mountain soils tend to be quite thin. I dug a hole that was probably about a meter by a meter, and I realized, “Oh, I haven’t hit the bottom yet.” [But] you can’t go deeper than that because your entrance is too narrow. So I then had to widen the hole before I could go down again. At one point, someone went, “Where is Simon?” The hole was then bigger than me. They were really impressed because this hole is just getting deeper and deeper and deeper. But for us, it felt like it was taking an age. But at the same time, that was quite exciting. It shocked us. It probably means that the forest has been there a very, very long time. Soil does not accumulate quickly. Matimele: [At the top], you walk through some sort of woodland vegetation path with some Brachystegia [a type of tree that’s common in Southern Africa]. Those are species with deep roots. They really, really need soil where they can deepen their roots in order to be stable. They [are] not a forest species. Brewin: There are all these tangly lianas, you know, vines and things like that — very deep leaf litter in the forest areas. And then there were these other areas, which are just exposed granite with [a] thin covering of lichen or grass, which, you know, were beautiful. They were a great spot for a picnic. You could just sit there on that and just look over it all. Obviously, there’s fresh water up there. As long as you have food, you can live up there for quite a considerable time really because of the water situation and the firewood. There’s plenty of firewood. Mount Lico seen from nearby Mount Socone. One of the first things spotted at the top of Lico was also the most mysterious: handmade pots. When the group visited the site, they asked the local people about the forest on top of the mountain. Had people ever gone up before? Some thought an earlier colonizing force from Germany had been to the top; others thought it was locals fleeing German forces who had climbed up. Due to conflicting information, combined with some local legends, it’s still unclear who’s been to the top and when. Matimele: We spoke to locals, and most of them didn’t know that much about the area. They kept saying, “Nobody has ever been there.” But I had [an] opportunity to interview some elderly local people. That’s where I got to hear for the first time that there were Germans [during WWI]. The locals said [that] the only people they recall that had ever been there were Germans. Brewin: The story goes that [local] people died up there because the Germans cut the rope or pulled down the rope that they were using for getting up and down, so these guys couldn’t get down again. Now, obviously, that was 100 years ago. It’s a massive amount of leaf litter and all the rest of it up there. These people have turned into soil clearly, picked apart by birds and that sort of thing, so there’s no traces of them at all other than these three pots that were found at the water source. Whether they were put there as some kind of prayer offering, I don’t know. But they were clearly very old pots — handmade. Timberlake: My suggestion would be that it was a ceremonial purpose, that somebody had been up, possibly to do with rain, a rain type of ceremony. If you’ve got a dry year in the surrounding area, you’re liable to have severe problems of hunger. So appealing for rain is a very important function, and mountains are often associated, quite rightly, with rain. Bayliss: The communities that I talked to said that they knew of nobody that had ever been up there in the community or their history. They talked of a tribe of little people who used to live on the top. And when they used to go to the base of the mountain, the little people used to throw snakes down on top of them. They talked about some personnel from the Portuguese Army, back in the colonial days, trying to climb Lico but they got halfway up, and then the tribe of little people cut the ropes, and they all fell down and died. This isn’t unique to this site. 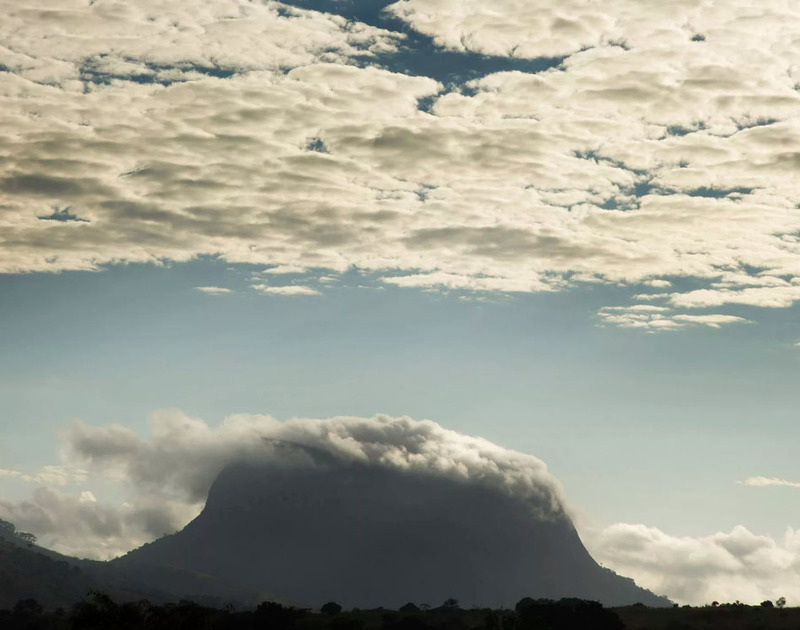 Even on Mount Mulanje in Southern Malawi, the people who live around the base of the mountain will talk about the Abatwa, the mythical little people who live on the top of the mountain. Julian Lines and Mike Robertson set up two static lines to climb Mount Lico. On any expedition, the possibility of getting hurt exists. Lico was no exception. Van de Ven: So, the thing is, you are in the tropics — so high temperature, high humidity, and you are in the bush. After one day, your clothes are already filthy with sweat and sand and grass, so it’s not a clean environment. You sleep in tents. So keeping hygienic is really important, and cleaning wounds and covering wounds is really important because, within 24 hours a wound gets seriously infected, and you can turn septic. Osborne: We had one serious incident [in] which Jonathan [Timberlake], my colleague in botany, got an infection on his leg. We had to get him down the mountain really quickly. Timberlake: The day before, I was walking around the base, and I cut my leg on a piece of grass. It was quite a deep cut, and I did wash it and clean it, but obviously not enough. By that evening, it was obviously getting a little bit infected. By midday the next day, I could start feeling that it was really not good and my temperature was going up quite a lot. The decision was to move back to that camp and then to come down. Lines: We had to strap him in, and he seemed to be okay going down. Mike [Brewin] went down with him by his side to make sure he was okay. And then we had to get him down through the jungle, which is probably harder because he was stumbling around down on the track, which he had macheted earlier on. It was lucky to get him down because I don’t know what would have happened if we didn’t get him down that night. Van de Ven: I treated him with antibiotics, cleaned out the wound, and observed him for 24 hours to see if I had to make a decision to take him to a hospital, which would be a four-hour drive from where we were. But luckily, he responded very well to the treatment. The moment he came down the mountain and it was already at the end of the day and dark, he was really hallucinating, had a fever of 40 degrees Celsius [104 degrees Fahrenheit] plus. But the good thing is, we were quick, and he was healthy enough to respond quickly. Timberlake: I was treated by the doctor in camp, who was quite concerned but [gave me] antibiotics. I did respond to them. But basically, I was confined to camp and had to have my leg up for the rest of the trip, which was very, very frustrating. But unfortunately, that’s the way it turned out. After spending two weeks rotating between camps, it was time to pack up and head home. Congdon: I know the regrets. I have been to so many places in Africa that I know I’ll never get back to, and I know there is so much now that I could do that I didn’t know to do then. If I had my time again, with the youth I had then and the knowledge I have now, what it would be like! But, that is the story of mankind. We all feel that at times. Bayliss: I was the last non-climber on the mountain, and I camped there the last night. Matt [Cooper], the cook, he went down [to Lico] because he had been basically on base camp the whole time cooking. You’ve got to spend at least a night up on Lico. Just before the last day, I took him up the ropes and we camped. It was just me and Matt. The last working day, Matt went down the ropes, and then I walked around the mountain and brought in my butterfly traps and brought in my camera traps. It was quite a moment because you’re packing your fieldwork away now. I was bringing everything down, and I am meeting Jules [Lines] at the top of the ropes. And we gave ourselves a hug and looked out over the views, and then I said, “Okay, I’ll see you down there then.” And off I went. The journey up Mount Lico meant different things to different members of the team. On a personal and scientific level, processing the findings of the unexplored forest will take months, if not years. 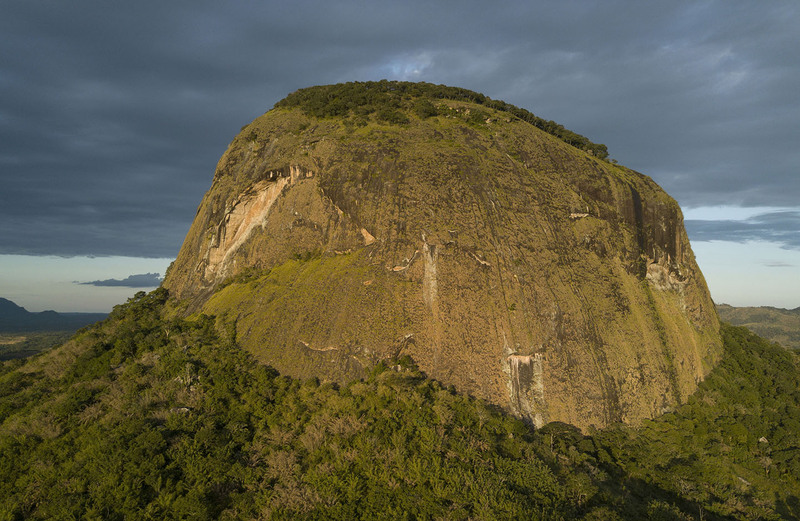 da Conceição: I [am] the first Mozambican woman [who] will climb this mountain. And it will be good for the other women, Mozambican women — encourage other women to do things. Willcock: On Lico, you are almost entirely certain if there is a change of any kind of vegetation or anything like that, it’s due to climate. So how Lico has reacted to past climatic changes will give us a good proxy of how the forest will react to future climatic changes. And that’s a very rare type of site that can do that without the confounding factor of human disturbance. da Conceição: [This trip] made me more confident — more confident and more brave. Lines: I haven’t done anything like this before and probably never [will do] anything like this again. Osborne: Hopefully, we can just leave it alone and go and look at it every so often, monitor what’s happening up there. Let’s see what happens in a place which is relatively undisturbed. Matimele: As we go, we get to know more and broaden our picture about what’s happening within [the] province. We got to record, document, and be able to provide good advice to the government, [like] what direction should be taken in order to ensure a standard of living for Mozambicans, but also make sure that biodiversity, flora, and fauna remain part of these places. Bayliss: Look what’s happening in Indonesia, Malaysia, a lot in the Congo, maybe even West Africa as well, where you have vast, huge areas of lowland, medium-altitude rainforests. It’s all getting clear felled for commercial interests such as palm oil… It’s probably the greatest environmental crime of humanity right now, this destruction of remaining rainforests, especially when they actually clean the air that we breathe and balance and govern the whole global atmosphere. What happens in Malaysia or the Amazon or the Congo will also affect the quality of air that you breathe in New York or London or Wales. It’s very shortsighted that we’re clearing all of this rainforest so quickly at such a devastating and large scale. Willcock: It was a privilege to go to a site like that. Not many people get to do it. It’s a similar number that walked on top of Lico than have walked on the Moon. Funding for photography provided in part by Alliance Earth. This entry was posted in Mount Lico project and tagged Conservation scientist, Dr. Julian Bayliss, Google Earth, jeffrey barbee, Jonathan Timberlake, Mount Lico, National Herbarium of Mozambique, the secret garden, The Verge.